Students in the University of Delaware’s Department of Animal and Food Sciences 417 Capstone Course spent the beginning of the spring semester on the farm in the early morning hours of the day or into the early evening on “lamb watch,” keeping an eye out to see if any of the pregnant ewes in the UD flock were about to give birth. 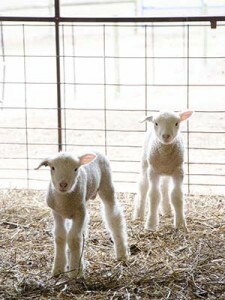 Under the guidance of Lesa Griffiths, professor in the Department of Animal and Food Sciences, and Larry Armstrong, farm manager, the students spent the month of March — which was peak time for lambing this year — watching over the 52 ewes, which produced 93 lambs. The figures were up from the 81 lambs from 42 ewes last year. Larry Armstrong and Kaitlyn Lutz work with UD’s lambs. The 30-member class was divided into groups with four or five students per group and an honors student liaison, as the class is also an Honors Program capstone course. Each student had to sign up for six lamb watches during the lambing season in addition to their regular lab meetings once a week. The earliest shift was from 6-7:30 a.m. and the latest was from 8-9:30 p.m. Each student had to write in a barn journal to provide an update on what they did and what they noticed for the next students scheduled to arrive at the farm, and Griffiths said that before spring break, there had been over 320 entries in the journal. Griffiths said that if a lamb was born on a group’s watch, that group would take care of the lamb for the semester. “They are responsible for making the decision as to when it’s appropriate to ear tag and dock their tails. They weigh and record birth weights, 10-day weights, 30-day weights, and they’ll administer their vaccines,” said Griffiths. She added that this real world, hands-on experience is critical to the development of the students.